A new pattern and a giveaway…all wrapped in one for the season. It’s getting cold outside and what would be better to make than something to keep you warm, relax your tired muscles, and make you feel cozy? A microwavable heat pack made with all natural flax seed and cotton fabrics. 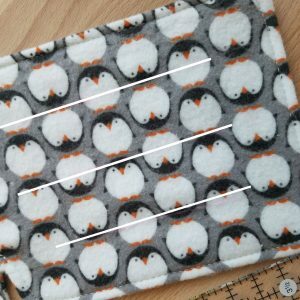 At the end of this tutorial I will be giving away a kit so you can make your very own with the cute organic penguin flannel from Cloud 9 fabrics. Cut 2 main fabric & 2 lining fabric placing template on fold. 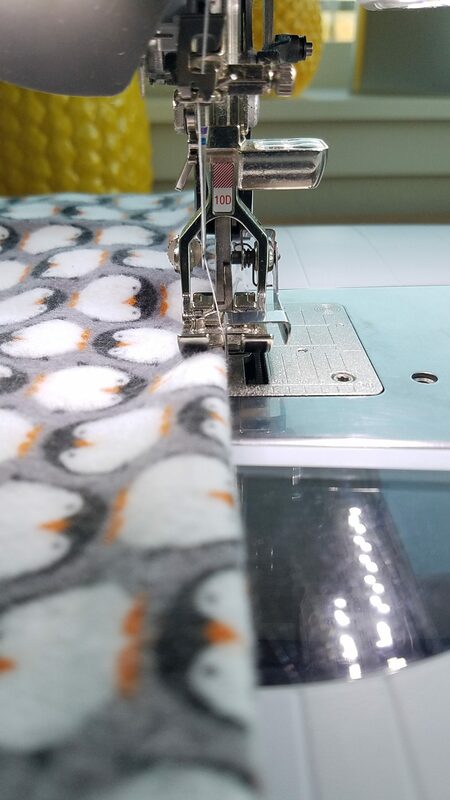 Place 1 lining on 1 main fabric piece. Repeat for second piece. Place layers with right sides of main fabric together lining up all corners and edges. Stitch 1/4 inch seam, leaving a 4-5 inch opening at top center of heat pack. Clip inner corners making sure not to clip threads. 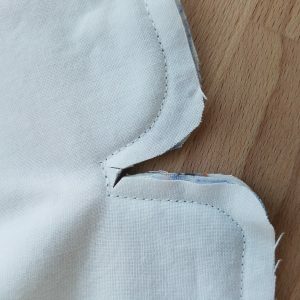 Using a stitch length of 3 or 3.5, edge stitch around seam making sure to back stitch at start and end of opening at top. Mark your top stitching to create the cells for the flax seed to move around. Keep the stitching at least 1 inch away from the edges of the heat pack. Stitch along your marked lines securing the stitches at the beginning and end of each line. Fill the heat pack with flax seed. I have found that a large smoothie straw helps get the flax seed in the hard to reach areas. A funnel can be used. I created a funnel using a paper plate and straw. Try to fill the heat pack as full as possible moving it around a lot to help the seeds settle into all the corners. Using pins or clips to hold the opening closed, fold over the raw edge, toward the inside of the opening and stitch the opening closed making sure to back stitch at the beginning and end. In order to warm, place in microwave and heat in 30 second intervals. 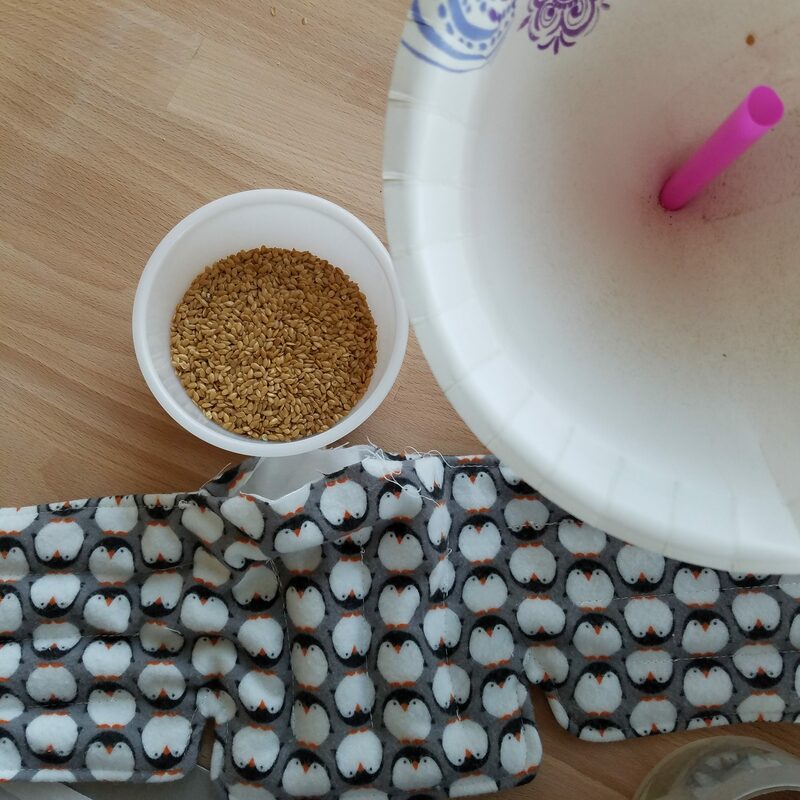 Remove between each interval and move around so no area of the flax seeds get over heated. It could take 3 to 5 intervals depending on the power of your microwave. I don’t recommend adding oils or fragrances to the filling since the heat pack will be placed in the microwave. 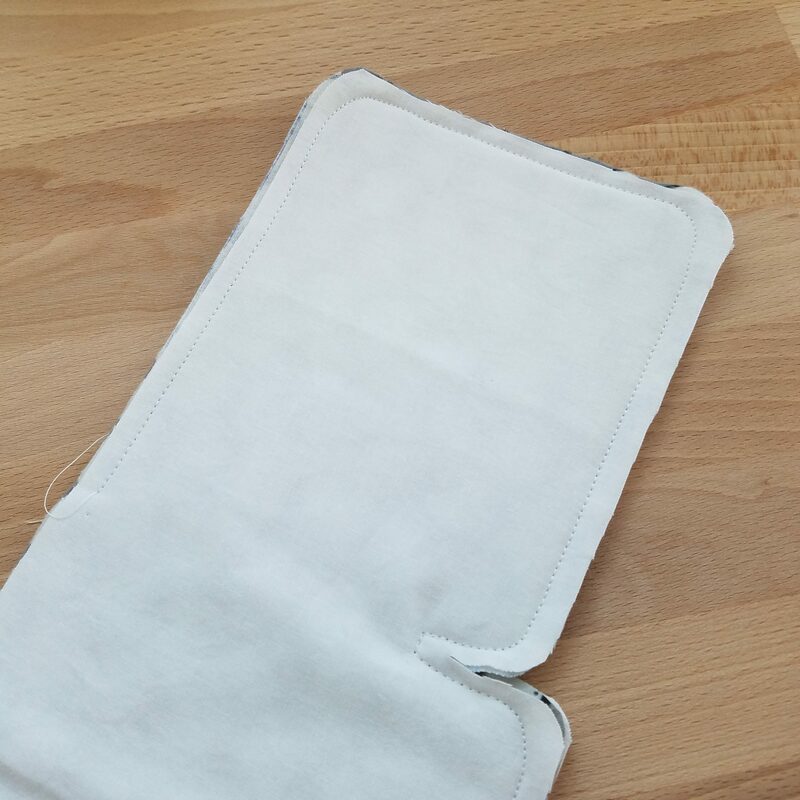 This heat pack can also be frozen for a cold pack. Just place in a ziploc bag in the freezer and use as needed. I am linking up with Giveaway Day at Sew Mama Sew. Be sure to visit and check out all the other great giveaways! Now for the giveaway! 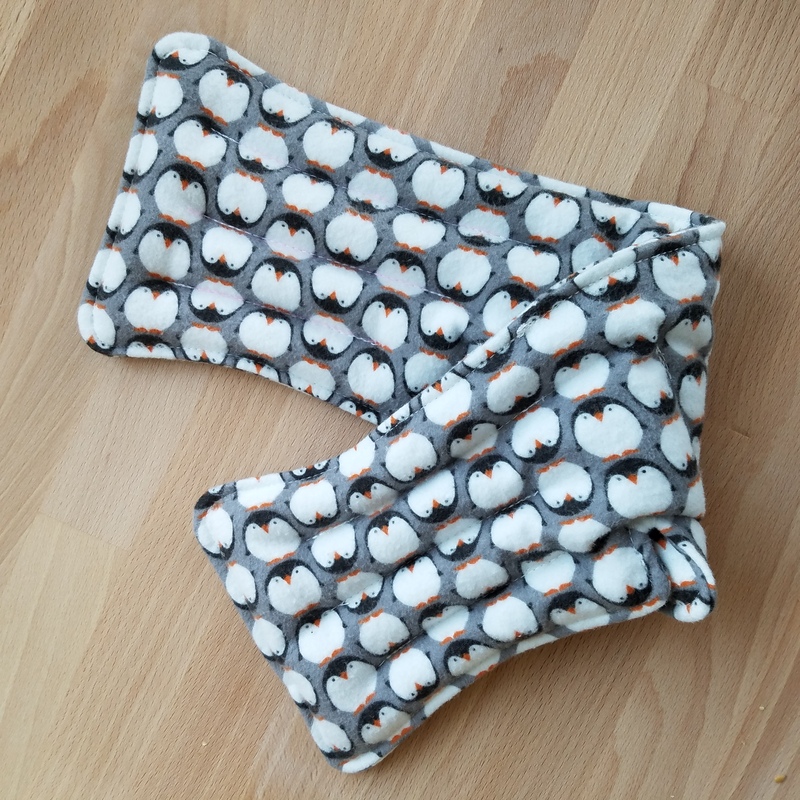 Wouldn’t you like to make your very own hot/cold pack? 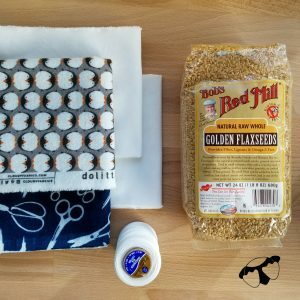 This kit has enough fabric & flax seed to make two…so you can make one hot and one cold! I love these packs. I have 2 in my freezer and one always ready to microwave for my sore achy muscles. When my muscles are tight they get the hot pack and when they just hurt they get the cold pack. I love to use my cold pack on my neck when I get headaches! Leave a comment and tell me what you prefer for your sore muscles….hot, cold, or both. Please be sure to leave an email address so you can be contacted if you win. Comments will be closed on December 11th at 5pm PST. A random number will be chosen from the comments and announced on Monday, December 12th at noon PST. This giveaway is open in the USA only. ***The winner of the giveaway is Cathy C. Thank you everyone for leaving comments. Whether you like hot or cold or both, I hope you will make more than one so you can have a hot & cold pack for all those aches & pains. I’d guess I’d have to say it depends on the season 🙂 In the summer–cold, in the winter here in Maine–warm unless I’ve just stubbed my toe or run into the wall 😉 Thanks for the adorable tutorial! Such a cute and easy pattern! I like heat on sore muscles. Awesome tutorials! I would never thought of using flax seed! Really clever! I usually use a hot pack. I prefer a heat pack, it’s more soothing. love those penguins. definitely hot for me. 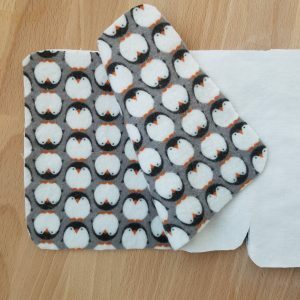 I love this tutorial and the penguin fabric! I used to make these in pockets with corn feed but the flax seed sounds interesting. I have a plug in hot pad that works wonders when I’m sore (or the present challenge of just being pregnant). Such a clever idea! Usually if my muscles are sore I just take tylenol or something, but maybe I ought to try this. I prefer hot, but there are times when you need cold. Great item to have . ..hot and cold . I like both . Thank you . I prefer heat for sore muscles but I know sometime cold is the proper treatment. I love hot pads! Mine have always just been a boring rectangle. 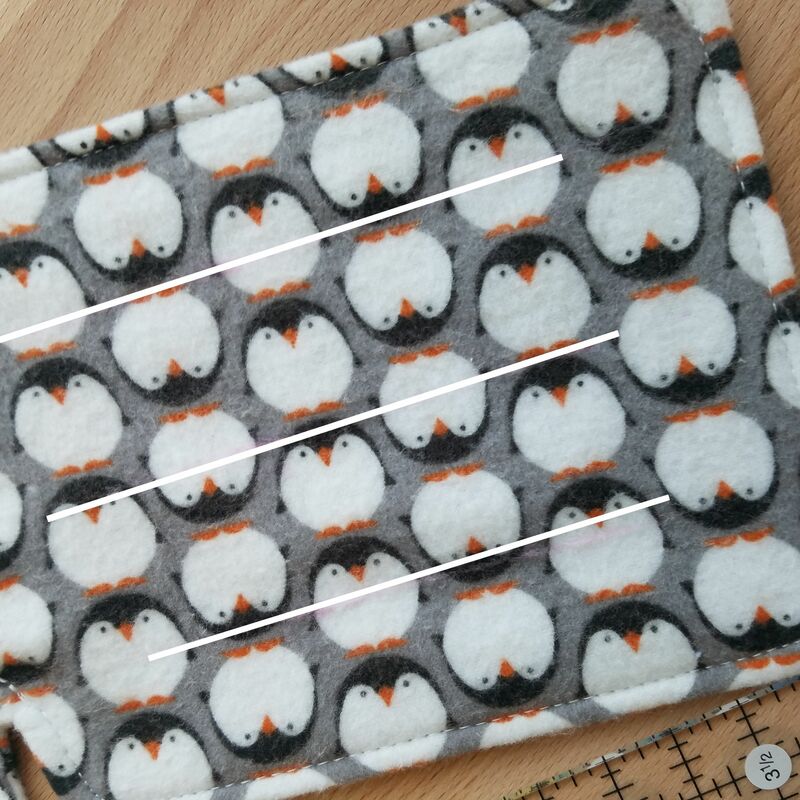 This pattern looks awesome! I will have to give it a try for sure! Thanks. I much prefer heat for my fibromyalgia and arthritis pain, but if I have an injury that swells (e.g., a sprain), I treat with cold first. I seem to get more relief using the cold packs. This is a Godsend!!!! For stiff neck I prefer heat! Though my PT recommends cold for everywhere else since heat makes the sore areas swell. Great timing for ”tis the season “!we enjoy AND overdo!!! Thank You!!!!! Great tutorial! I use heat for everything except my migraines, which do better with the cold. Prefer heat on my sore muscles and cold if I accidentally ‘bump’ into something. Thanks for the tutorial! I would say hot. Really makes the muscles feel better. Cold! What a fun project, thanks for the chance to win! Heat for me! Thank you for the tutorial…I’ve made rice bags before, looking forward to trying flax seed! Wonderful tutorial! I get more relief when I use cold packs. I love hot, always feels so good! I like hot best but my doc shakes his head and recommends cold. Definitely both! Thanks for the chance! Most of the time cold for inflammation, tho hot sometimes feels better! Cathy…you are the winner of the giveaway. An email will follow shortly. Congratulations!! I like hot best–nothing beats a hot shower. But I’ve never tried a hot pack like this! I like heat on sore muscles, cold for bruises. Because I am always cold, I prefer heat packs. Your tutorial is great–thanks! I usually use ice packs but a hot pack definitely serves it’s purpose well at times too! Thanks for the chance to win! Merry Christmas! I love to snuggle with a heating pad. I always use heat on sore muscles and cold on sprains and strains. Such a cute and practical project. Thanks for the tutorial! I like both, switching about every 15 mins for an hour or so. I love your use of the channels and that fabric, GAH, TOO cute!!! Thanks SEW much for the giveaway! i love a heat pack for sore muscles! thanks love your tutorial! I used my flax seed heat pad yesterday on my neck. I prefer a heat pack for sore muscles. Mine is made out of jean material. I would love to try this in flannel! Thanks for the chance. Great tutorial. I like hot on sore muscles. Thanks for the chance to win. Cute hot pack! I like hot for sore muscles and cold for injuries. Thanks for the chance to win a kit! Great tutorial. I like heat for sore muscles. Thanks for the chance to win. I prefer hot. Thanks so much for the cute giveaway. Heat, definitely! And my daughter and grand daughter would love one of these. I use both depending on the situation. Achy gets hot, cold for bruises, swelling, headache! this is wonderful. thanks for the tutorial and pattern. I will be making up some of these. When I get sore muscles, my body responds well to heat. What a great tutorial. Thank you. I prefer heat. Whenever I use cold I tense up and cause other issues. 🙂 Thanks for the chance to win. In the moment I like the hot, but when I’m really hurting it’s the cold that helps the most. 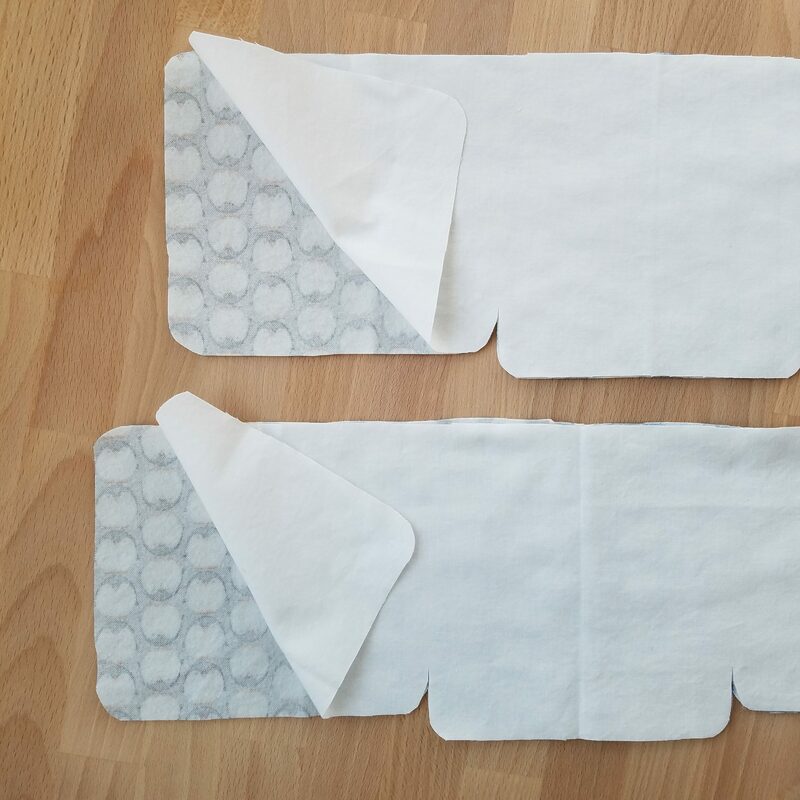 I like to have them handy for my kids too–nice for minor hurts and for cooling or warming up when they go to bed depending on the season. Hot hot hot! Love the tutorial! These are very cute and who couldn’t use something for aches, especially me! I prefer hot/warm packs, they feel more soothing to me! Thank you for the generous giveaway! Thanks for the tut too!! After a hard workout or just hard work I like to start with cold but then switch to heat later. For headaches I almost always choose cold. I’m a heat on almost everything will help person. My cousin, that I will be making this for is a cold helps everything person. Hot usually. Thanks for the tutorial. Wonderful pattern! I use my husbands old sock (really) fill with rice to put in microwave to heat up. Yes, I am a heat person for aches! Definitely hot and not cold! Cute set and pattern, thanks for the chance to win! This is a wonderful tutorial that I will definitely be making! Thank you so much for sharing it! I would love to win your give away, the fabric is adorable and all of the materials necessary to make a “HOT” pack (always)! Have a fantastic creative day! I prefer hot packs because I am always cold! I hope i win this thanks!! My husband was asking for this the other day – I would love to make a hot pack! This is a great project. I use an old neck wrap filled with beans for relaxation – not nearly as cute as Mr. Penquins! Enjoy the day and thank you for the giveaway. I alternate hot and cold. Cute kids! Mostly hot for me. Always try that first. Thanks for sharing your pattern. I normally prefer heat, but it just depends. Oh, I totally need to make this – my son likes to steal the one I have every time I use it. And I am all about the heat for sore muscles! Thanks for the tutorial and giveaway! My trainer says ice is better! Thanks for participating in the Giveaway Day. hot for my muscles, though having a cold pack for my kids’ bumps and bruises would be great as well! l always use hot for aches and pains. definitely hot – especially when it’s cold outside. I have used both hot and cold for muscle aches. Both can work. these heat bags are neat. Hot, definitely hot! 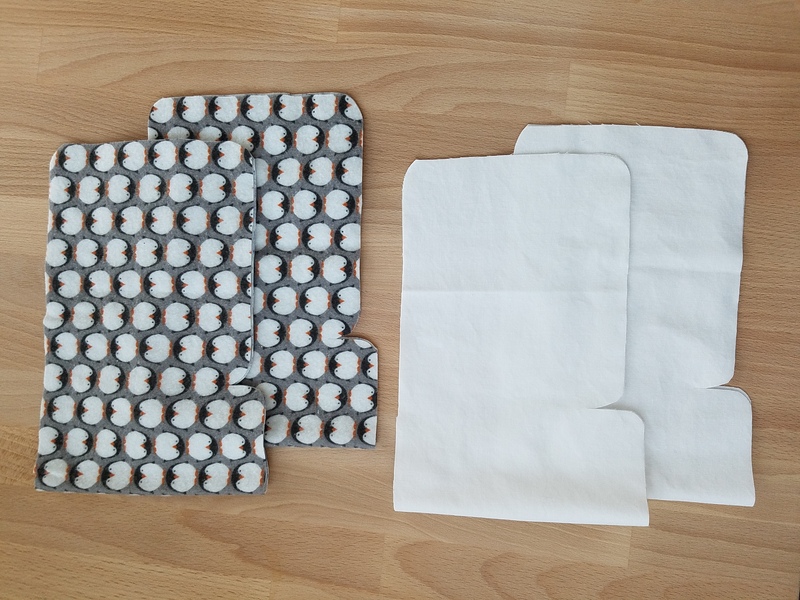 I made a rice heat pack that saved my hips during pregnancy. Heat in all weather. I love to feel the heat! Thank you for tutorial for the hot/cold packs! 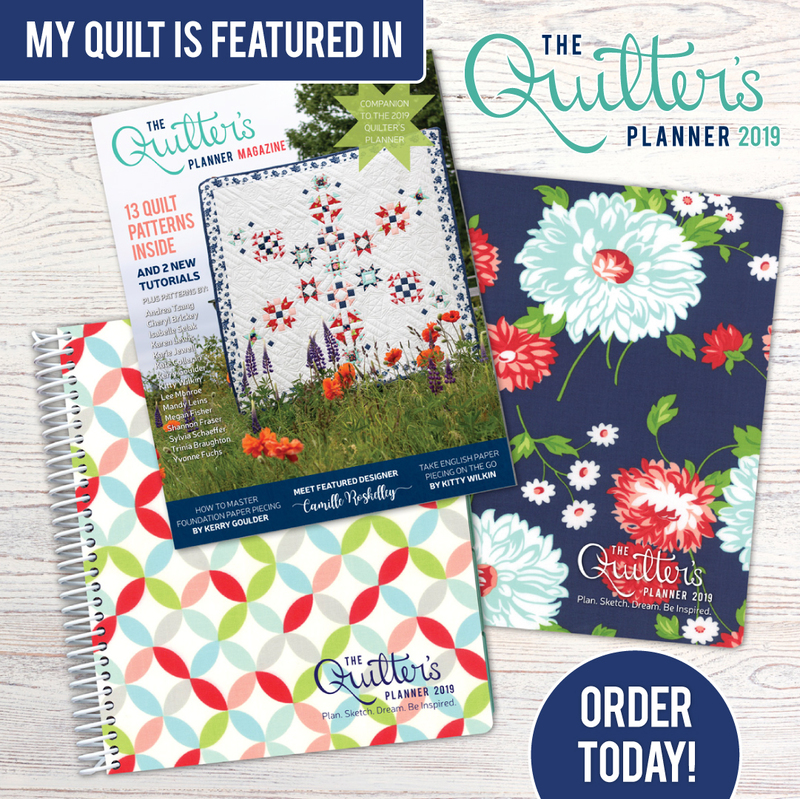 I really need to make a new one for my husband – and I like your design! For me its hot that I like to use the most! thank you!! Definitely hot for me. Thank you for the tutorial. I could make some for Christmas gifts for the elders. Overnight low is project at 69 degrees tomorrow. For us, that’s cold! Miss having you around … please come back for a visit soon! Oh I wish I could!! Our overnight low is supposed to be 20…and with the windchill…9…yes 9!! I miss you and Hawaii!!! Definitely hot! A hot shower is about all that helps my neck, but I’ve never made one of these! It has to be hot! What a clever giveaway! Heat always feels more soothing to me. Thanks for sharing! I go back and forth between hot and cold packs when I have a muscle spasm in my neck or back. That seems to help me the most. What a great tutorial and I totally want to make one now! I like heat, but I should probably use cold more often. Thanks! I love my heating pad! I’d love to make one of the packs. I prefer heat on my sore muscles. I use heat and cold for new/old injuries and aches. 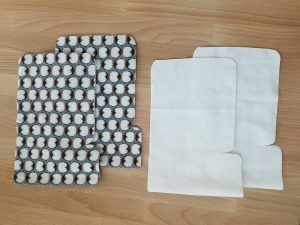 I’m a big believer in the healing power of them both, I love this tutorial and I love your fabrics!!! Thanks for the chance. Hot! Makes me think of hot water bottles from when I was a kid. After knee surgery I got to love my cold packs. I could never stand them before! I prefer hot. Those penguins are adorable. Thank you. Great idea! Thanks for the chance. Going to PT now and he is ending session with ice pack – I’ll have to ask him when to use the heat. But I’d start with cold since he has now too! Best wishes! I have done both the cold and the hot for my sore muscles. My boyfriend put some arthritis pain relief called Capsaicin on my back and I have found that this really works for me. But I love your clever idea and I do believe that this would make a great Christmas gift. Thank you for being a part of the SMS Giveaway and the chance to try and win your giveaway. Wishing you Happy Holidays. Depends on the area…if it’s my neck I prefer heat and if it’s my knee ICE! What a great idea. I love heat! Thank you for chance to win! This prize would be made & used often round here! I love this – the shape is really excellent! 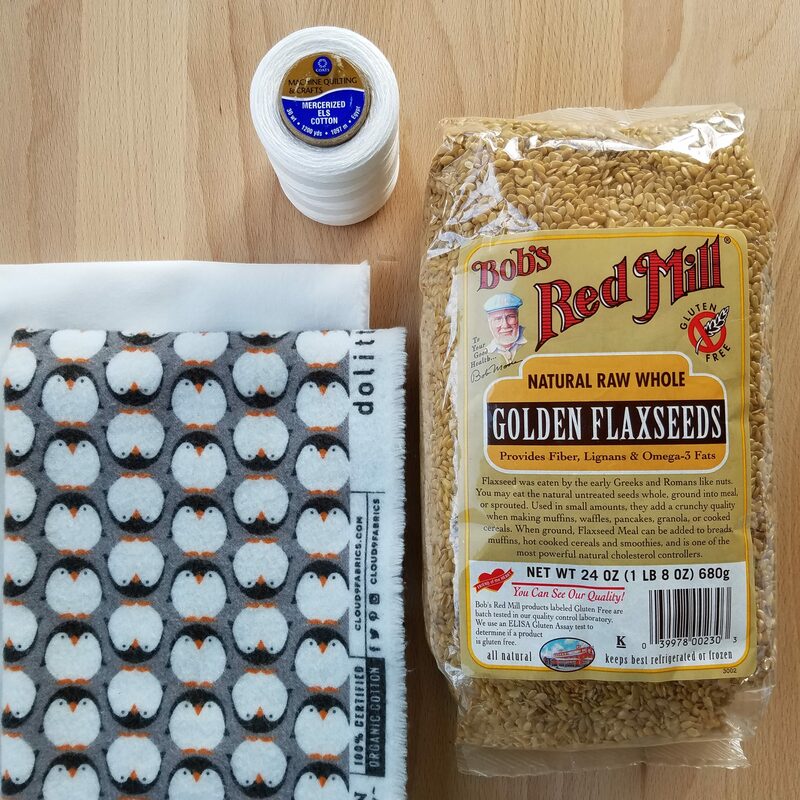 And the golden flaxseed is so nice. I prefer heat on my aches and pains, love your pattern! I always filled these with rice…never considered this! Like this better. I like cold on sore muscles. I like hot shower but cold ice back. I’m nursing a sore shoulder right now and dreaming of my hot pad waiting for me at home! Cold just seems to make me more tense and sore. I prefer hot packs because I’m usually already cold. 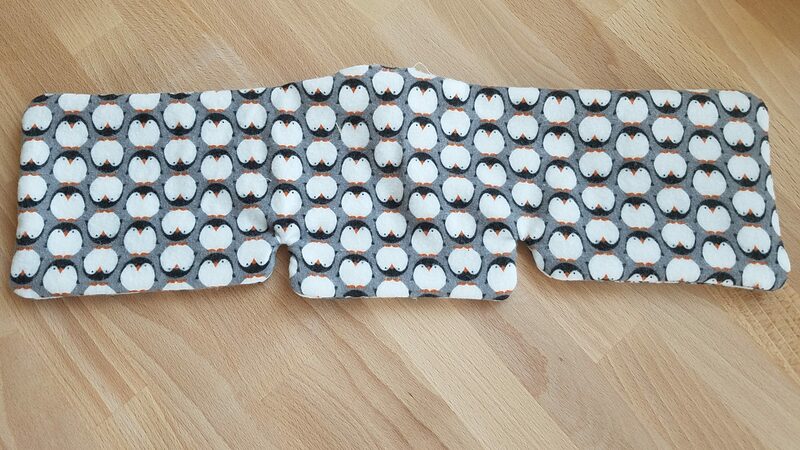 Love this penguin print! I like my muscles warm! I don’t like being cold. I’ll be making a hot pack! Thanks for the giveaway! So cute! My son is crazy about penguins right now. Absolutely hot for sore muscles! I prefer hot for aches and tender muscles. Merry Christmas! I live hot, but cold works the best. I love this project! Awesome kit! I have fibromyalgia and hurt most of the time. I prefer using heat and would love to make one for moi. This is so great. I have had this project on my to do list for years now. I love a nice warm compress on my sore muscles. Hot for my hunny…he is always cold during the winter.